Strombafort - a synthetic steroid known today is very popular among bodybuilders from around the world. Usually, the course of the drug has a duration of 6 weeks. For those athletes who want to achieve a particular result, of course, the drug can extend up to 8 weeks. Please note that the course of medication lasts without interruption. The rupture is not recommended for the simple reason that this drug is classified as a time short-acting drugs. What does mean? This implies that enter the body acts, which remains active within only about 8 hours. The primary objective of the course undoubtedly builds muscle mass and power of the athlete performance. Like the majority of steroids, this drug can be taken in combination with other anabolics as well as complexes of sports nutrition. Only experienced bodybuilders use this type of courses. 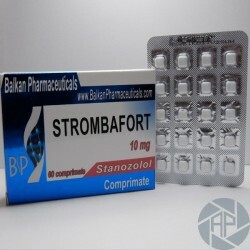 In itself, the substance stanozolol - is gentle enough weight on it grows very slowly, but the phenomenon of reversion occurs just at the end of the course. It is also a good time for the use of the drug is that it can be used even by women bodybuilders. This is achieved due to its mild and gentle on the body. Now let's talk about the dose of the drug. Each dose athlete is individual and depends on factors such as the amount of time that an athlete trains its physiological characteristics, the way in which it is trained or acts, and so on. Speaking in optimal dosages approximate can tell that for male athletes, it is 10 mg to 50 mg per day. As a general rule, a relatively small dose and used little athletes. One greater quantity of the drug, respectively, will require that representative of big sports and energy, like bodybuilding, weight lifting, all types of struggle. Women who dare to take medicine, the dose is around 5-10 mg. The drug has excellent properties which are ideal for the recruitment of muscle mass by all groups and categories of athletes. However, it has a relatively mild effect. This explains their intake in female bodybuilding. However, in the opinion of experienced coaches and bodybuilders, the dose of the drug is likely to rise, since the side effects of all that nobody has canceled it. In their own words, perhaps also taking the medication not the only type, i.e., not in isolation, but in conjunction with other anabolic steroids. It achieves a maximum effect and will reduce the risk of some side effects. Although, in general, the drug is considered mild and moderate, however, it does have some side effects. Their presence may be caused, first, failure to comply with the recommendations related to the dose of the drug. Among the most common side effects blood pressure, increased levels of bad cholesterol, the hair loss is rising. In some cases, there may be damage to the liver. However, if you follow the simple rules and not to exceed the dose of the medication, the side effects do not annoy the athlete.